Measurement technology requirements? Order your standard instruments for pressure measurement easily and directly from us - with the WIKA quality you are accustomed to. The manufacture of measuring instruments for pressure measurement has a long tradition with WIKA. We have now been producing mechanical pressure gauges for over 60 years. Today we are recognised in the market as leaders worldwide in the fields of temperature measurement, pressure measurement and calibration technology. Worldwide, approximately 600 million WIKA measuring instruments are in use. In electronic pressure measurement, the pressure is measured by a sensor which receives the pressure to be measured, or the change in pressure, and converts it into an electrical signal. The electrical signal is then a measure of the magnitude of the applied pressure or the pressure change. WIKA offers you measuring instruments with all the sensors you would normally expect in the electronic pressure measurement market: Metal thin-film, ceramic thick-film and piezoresistive. WIKA develops and manufactures these themselves. For system control and monitoring using mechatronic pressure measurement, mechanical measuring instruments are combined with electrical output signals and/or switch contacts. The electrical output signal enables modern electronic measured value registration. Electrical circuits can be opened and closed using switch contacts. Thus, plants cannot only be monitored, but also directly controlled as set measured value limits are crossed. Mechanical pressure switches complete the WIKA portfolio. In mechanical pressure measurement, measuring instruments are used with pressure elements that deform elastically under the influence of a pressure which is positive or negative in relation to atmospheric pressure (ambient pressure). In contrast to measuring instruments using electronic pressure measurement technology, they do not require any power supply for operation. Alongside their simple operation, their advantage lies in their marked robustness. WIKA offers you mechanical pressure measuring instruments with scale ranges from 0 ... 0.5 mbar up to 0 ... 7,000 bar. Diaphragm seals extend the portfolio from WIKA. 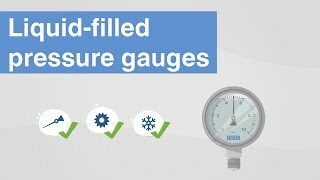 By using them, an accurate pressure measurement is also possible under extreme conditions. From WIKA, you can find the ideal diaphragm seal for each application. 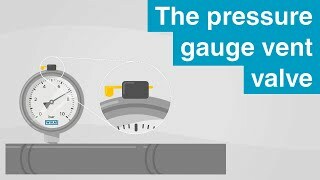 The pressure gauge vent valve | This is what you have to look out for!